Today I am going to tell you about Lamont boiler. 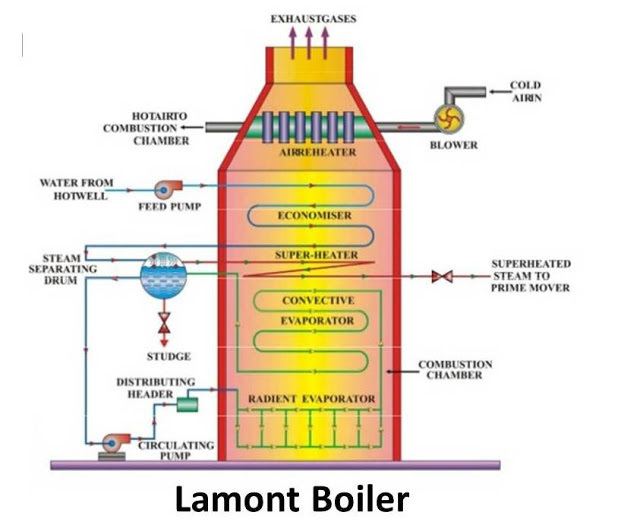 Lamont boiler is the first forced convection boiler which is introduce in the year 1925. A water circulating pump is used in the boiler to circulate water inside the boiler. This pump is driven by the steam turbine which uses steam of boiler. It is used in power plant industries to generate electricity. This boiler works on basic principle of forced convection. If the water is circulate by a pump inside the tube, the heat transfer rate from gas to the water is increases. It is the basic principle of it. This boiler is the first force circulation boiler. This boiler consist various part which are as follow. the boiler efficiency. The feed water first supplied to the economizer before entering to the boiler. The Lamont boiler is a force convection boiler. So a centrifugal pump is used to circulate water inside the boiler. This pump is driven by a steam turbine. The steam for the turbine is taken by the boiler. The evaporator tube or can say water tubes are situated at furnace wall which increase the heating surface of boiler. This is also at the up side and down side of the furnace and other equipment. The main function of these tubes to evaporate water into steam. This also cools down the furnace wall. The space in the furnace where the fuel is burn is called grate. It is bottom side of furnace. In the Lamont boiler vertical furnace is used. The main function of Furnace is to burn the fuel. The steam generated by the evaporator tube is saturated steam. If it directly used in steam turbine can cause the corrosion. So the saturated steam sends to the super heater where it can increase the temperature of steam. The steam separator is situated outside from the boiler. The mixture of water and steam from the evaporator tube send to the steam separator where it separate the steam and send it to super heater. The remaining water again sends to the economizer. It’s main function to preheat air before entering into furnace. Lamont boiler is a forced circulation, internally fired water tube boiler. The fuel is burn inside the boiler and the water is circulating by a centrifugal pump through evaporator tubes. The working of this boiler is as follow. A feed pump forces the water into the economizer where the temperature of water increases. This water forced into the evaporator tube by using a centrifugal pump driven by steam turbine. Water passes 10 – 15 times into the evaporator tube. The mixture of saturated steam and water is formed inside the tube. sends to the steam separator drum which is outside the boiler. Steam from the separator sends to the super heater, where the saturated steam converts into superheated steam. The water again sends to the economizer where it again passes by the evaporator tubes. The air from the air preheater enter into the furnace where fuel burn. The flue gases first heat the evaporator tube then passes by the super heater. These gases from the super heater again use to preheat the air into air preheater before exhaust into atmosphere. This working pressure of this boiler is above 170 bar and have the steam generation capacity of about 50000 kg/hour at temperature 773 K .
1. It can high pressure boiler. 2. It is flexible in design. 3. This boiler can reassemble in natural circulation boiler. 4. It can easily start. 5. It has high steam generation capacity of about 50 ton/ hour. 6. This boiler has higher heat transfer rate. Today we have learnt about Lamont boiler. If you have any query regarding this boiler, ask by commenting. If you like this article, don’t forget to share it on social networks. Subscribe our website for more informative articles. Thanks for reading it. 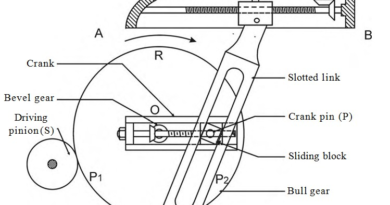 This difficulty was solved in loeffler boiler(by preventing the water flow in boiler tubes). What are the disadvantages of this boiler ? what is done with the super heated steam afterword ?? Bubble formation is one of the major disadvantage of this boiler. How are bubbles formed inside the tubes of the boiler? This drawback is solved in Benson Boiler. But how? To avoid it we heat feed water at critical pressure, in this the formed vapour and water both having same density. Which arrest formation of bubble.